It appears that 2017 was a great year for Apple, Google and mobile users alike, at least according to the latest report from research company SensorTower. The report claims mobile users spent no less than $58.6 billion on apps and games last year via in-app purchases, subscriptions, and premium apps on both the App Store and Google Play. Suffice to say that's a 35% increase over 2016. Although App Store at about every category, there's one where Google Play is far ahead of Apple's applications store: first-time app installs. The report published recently by SensorTower confirm a 13% growth of the global first-time app installs, which amassed 91.5 billion. 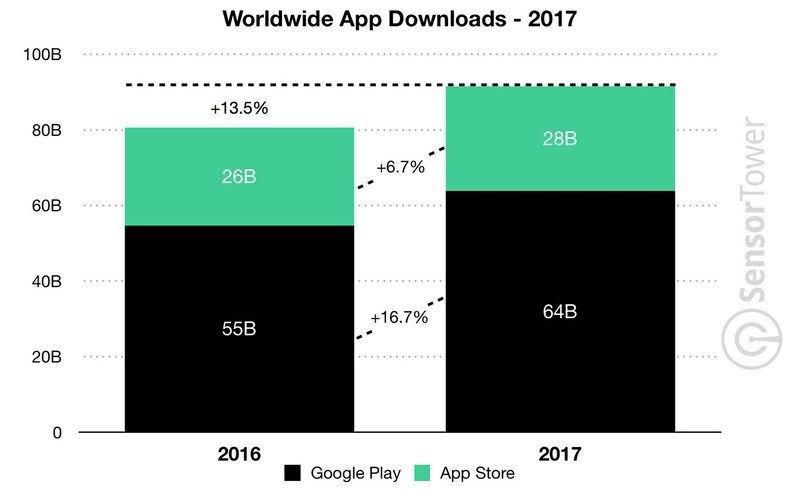 While Google Play app downloads increased by 16.7% to reach around 64 billion, App Store first-time app installs only grew 6.7% (28 billion). One of the main reasons Google Play had more first-time app installs than App Store is the higher rate adoption in emerging markets. Google continues to support the Android One program, which brings cheap, solid smartphones to markets where feature phones are still predominant. However, if you are a mobile developer, you'll probably want to launch your product in the App Store first. iOS users spent around $38.5 billion on the App Store in 2017, while Android consumers spent only $20.1 billion on Google Play. Let's not forget though that the latter is not available in China, a huge mobile market where Apple thrives when it comes to App Store in-app purchases. The same goes for worldwide mobile game revenue where App Store wins big. Before going into details, it's worth mentioning that game revenue on both App Store and Google Play increased by 30% from 2016. 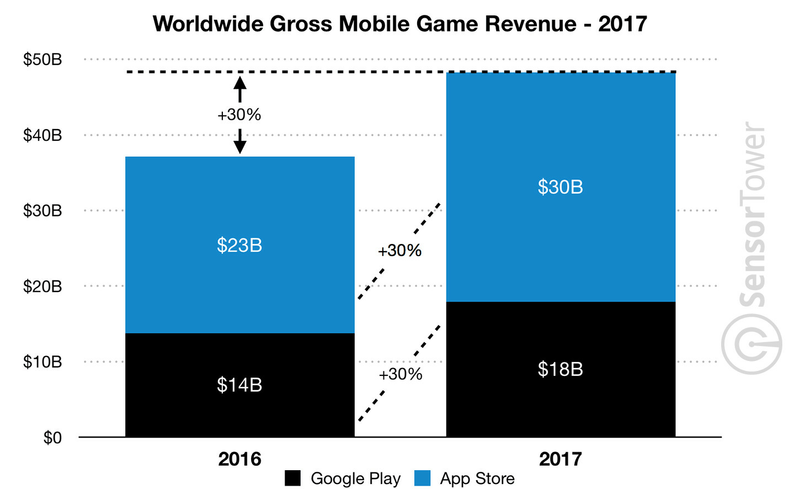 Game revenue on App Store grew at 30% with around $30 billion spent in 2017, while Google Play Store accounted for just $18 billion. Even so, Google Play's numbers are still a 30% increase from 2016. You can find the rest of SensorTower's report at the source link below. People tend to forget that there is a lot of good free apps now. As a matter of fact the most revenue generating apps are all free. Sure most of those free apps have ads or in app purchases, but they are still considered free. The other thing to note nowadays, is for every 1 app that arrives on the app store 3 arrive on the Play store. Check out App Annie yourself. As a matter of fact there is over 800,000 more apps on the Play store now over the App store. That trend is not going to slow down either. If you really want to make money on an app, then you target both platforms. This is google play store vs iOS store *NOT* android vs iphone Please note that china dont use play store. India, Russia also have plenty other app store. App Store probably still leads in profits, since hardly anything of actually use is free. The free stuff has in app purchases, to really take advantage of the app. I honestly prefer the Play Store now. What's crazy, is that on a lot of android phones, you have the big 3, Galaxy app store, Amazon, and the Play Store and Google still moved ahead of the App Store. yeah, Galaxy Apps is a bloat. i don't know why Samsung even care to develop one. False. Samsung has e,elusive apps for Galaxy phones. All all the Gear apps are on on Samsung store. Do you must be high, uneducated or both.all things like fonts and tools, are design for Galaxy phones only. 1/3 of the apps on my Note came from galaxy apps. 1/3 from Google and the rest when Amazon had a store. To use a gift card scroogle is demanding your driver's license and bank statements. You sir are a liar. That is such BS. I have used gift cards and it doesn't require any of that. Not talking about App Store apps being way more than expensive? Most apps are under two dollars. If that's expensive in your eyes, find. But objectively... app pricing is perfectly reasonable. Many of the ones Apple charges for, we get free. And the ones we do buy, we get to try for a day and if we don't like we can get a refund. Something Apple doesn't offer. This makes me want to be a software developer.